About Great American Adventures "We grew up in love with the history of the American West... the Wild West... over the years it became our passion. We create and host our historic wild west horseback rides - and the occasional steamboat cruise, tour and European vacation - with the goal of making a difference in people's vacation experience. We create opportunities for people to fulfill their dreams, maybe even their childhood fantasies. Each adventure promises to be separate from the herd... and historic... fun... and safe! Most importantly, we want them to be special - out of the ordinary - and to reenergize you! Travel should be fun, easy, and worth the time and price paid. Our hope is every rider, regardless of their horsemanship ability, will gain a unique appreciation for the ride and its relation to Wild West history. And, we throw in some Hollywood myth too! Offering historians, dressing in period attire - if one so chooses - taking trails less traveled, plus a few surprises we always enjoy adding... it's a great start to an inspiring and memorable vacation." Great American Adventures is owned and operated by Steve and Marcie Shaw, both having shared a great love for history revolving around the Wild West. That common interest blossomed into a passion and they began to offer horseback riding tours that showcase noteworthy locales and equally prominent Western icons. From Billy the Kid’s journey to Lincoln, New Mexico to Custer’s Last Stand at the Little Bighorn, the tours they organize promote an engaging and enriching experience for every participant. As they create and host their historic horseback riding tours, Steve and Marcie strive to make a difference in people’s vacation experience. Whether you choose Wyatt Earp'a Vendetta Ride in Tombstone, AZ or John Wayne's Monument Valley Ride, each tour is meant to be an adventure separate from the rest of the herd; a fun and historic journey in itself. Every ride is considered special and safety is likewise considered greatly. With Great American Adventures, riders take the trails less traveled, wearing period-correct clothing (though not mandatory). You will be accompanied by knowledgeable historians and wranglers. Apart from the usual tour, Steve and Marcie also incorporate a few surprises for each ride, ultimately creating one memorable vacation experience for everyone. From their John Wayne's Monument Valley Ride to Wyatt Earp's Vendetta Ride, Steve and Marcie hope their horseback riding tours will develop, in every rider, a unique appreciation for their adventures and its remarkable connection to Wild West history. Be a part of Great American Adventures’ Historic Wild West Horseback Riding Adventures and Tours. Travel to historic sites, see the wonders of Monument Valley or relive the excitement of Wyatt Earp and his posse in Tombstone, AZ. 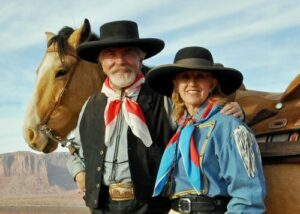 Steve and Marcie Shaw are waiting for you to book your reservations today... Join their ever-growing "family" of Wild West history and Western-movie loving horseback riders. Steve Shaw, creator and owner of Great American Adventures, LLC has had a passion for the Wild West and travel since he was a small boy. Every summer his parents drove from their Southern California home to Texas and Oklahoma to visit family, and Steve always wore his Western clothes, his beloved cowboy hat, boots, buscadero holster rig and play-guns from his favorite TV Westerns. Out the car window he envisioned himself at a gallop, riding over the rough and rugged terrain in pursuit to save a heroine in distress, fulfilling his cowboy fantasies. At this same time, 3,000 miles on the other side of the United States, a very young Marcie was playing Annie Oakley and other Western feminine heroines in her hometown of Pittsburgh, PA, fulfilling her childhood cowgirl fantasies. Separated by a continent, neither knew what the future held for them... a passion for one another, a passion for travel and ultimately, a passion for the Western... both historical and in film. All of this would be realized once they met and married some 20 years later. Embarrassingly as it sounds, during Steve's last year in college and having been accepted to the United States Air Force Officer Training School, he and his college buddy, another OTS candidate, traveled the country looking for “locations” for their homemade, thirty-minute, 8-millimeter Western called “Butch and the Kid,” patterned after Paul Newman’s and Robert Redford’s “Butch Cassidy and the Sundance Kid.” You can imagine what his Air Force recruiter thought when he saw this film at Steve’s going away party! In fact, while serving in the military, after having earned his aviation wings and graduated from B-52 Navigator/Bombardier School, Steve chose, of all USAF bases, the one in Rapid City, South Dakota … Ellsworth Air Force Base. Why? Because of the surrounding area’s history: the Black Hills, Sitting Bull, Crazy Horse and the Sioux Nation, Gold Rush, Deadwood, Wild Bill Hickok, General G. A. Custer, Wounded Knee and much more. The other officers thought he was crazy... but Steve had the time of his life!! His military obligations behind him and both he and Marcie having retired early from corporate America - an accomplished goal - Steve soon gravitated to writing short stories about the Wild West. In a few short years, Steve had written over 300+ articles published in various magazines, including such subjects as Wild West history, Western celebrity interviews, Western lifestyle events, book reviews, and fiction and nonfiction short stories. With these stories, Steve won a few writing awards! In 2004, Steve was honored to be accepted into the prestigious Western Writers of America, Inc., organization. 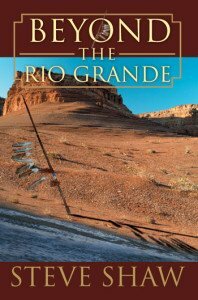 In 2007, his first novel, "Beyond the Rio Grande," received an award as "Finalist," from the New Mexico Book Award program (click on the book for a summary, reviews and to purchase), as well as excellent reviews from magazines, fellow authors and readership clientele. You can find the story line, reviews, testimonials from readers and how to purchase this book under "About" in the header. Just click on it. In 2010, Steve's Civil War-themed "Soldiers, One and All" was the Grand Prize Winner in New Mexico's 2010 Short Story Fiction Competition. The following year, 2011, his Western family-oriented story, "PePe's Race," won second place honors. And in 2013 he once again was the Grand Prize Winner in New Mexico's Short Story Fiction Competition with his, "A Passion for the Old West." Steve is the first to admit that Marcie's support in his writing endeavors is invaluable ... without her, he'd never complete one story! As a result of his writings, Steve was featured as a historian in 2004 on the A&E Biography channel's "Doc Holliday" episode. Both Steve and Marcie began doing background work in TV and films and both appeared on the History Channel's "Wild West Tech." Steve also appeared on HBO's Deadwood series, Disney's 2013 The Lone Ranger, and Seth McFarland's "A Million Ways to Die in the West" in 2014. As a result, both have numerous television and film production credits. Wanting to do more than just write about Wild West adventures, Steve and Marcie, hand-in-hand, were soon traveling to be part of the action… such as riding in Wyoming at the Hole-in-the-Wall location where Butch, Sundance and their Wild Bunch hid out. Marcie, childhood friends of the Captain of the Delta Queen Steamboat, mentioned it would be fun cruising down the Mississippi River on a steamboat (after all, she did camp out - for the first time in her life - every night for five nights during their Wyoming horseback ride - and Steve owed her big time for that experience). Cruising on this historic paddlewheel and wearing 19th Century period-correct clothing, Steve & Marcie had a brainstorm… if they were having this much fun, why wouldn’t others? Thus began their “Greatest Adventure” … offering Wild West adventures on horseback rides, steamboat cruises, trains & tours - striving for a look back into our Wild West history. True, their adventures have taken them across the globe, touring most of Europe... heck, even Buffalo Bill toured Europe! Marcie, never to be out-done by Steve, began sewing - a skill she learned as a young girl - and created her own Victorian ball gowns, 19th Century-period day dresses, riding attire and even a few of Steve's clothes. In fact, she became such an excellent seamstress, the History Channel approached her about creating designs for some of their shows. She also became a fabulous photographer, taking many of the photos within this website and she achieved that rare photo... which appeared on the cover of the June 2009 True West magazine, themed "Custer's Ride to Glory"! Her photos have since appeared in True West, Wild West, Cowboys & Indians and American Cowboy magazines. Since 1998 Great American Adventures has offered steamboat cruises on the Mississippi, Ohio and Cumberland Rivers (think riverboat gambler and Civil War), the Columbia River in the Northwest (think Lewis & Clark and the Fur Trade), and in Alaska (heck, even Wyatt Earp went there). Their train trip to the Canadian Rockies, private tour of Gettysburg, and historic tour of south Texas and the Alamo (where Steve & Marcie renewed their 30th wedding anniversary vows at John Wayne's Alamo Village) were all greatly received, each becoming favorites among friends and clientele. Their first historic horseback ride was offered in 2004 -- "Custer's Ride to Glory." From then until 2011, this ride was the epitome of historic rides, offering cavalry training school, fighting Indians on the Crow Indian Reservation, riding various historic routes that the troopers of Custer's command had ridden at the Little Bighorn, and, once, staying at the 7th Cavalry’s barracks at Fort Abraham Lincoln and training on the very parade grounds where Custer and his famed 7th Cavalry trained. With the success of their "Custer's Ride to Glory," Steve & Marcie had the confidence to create, organize and host other rides. "Butch Cassidy's Hole-in-the-Wall Ride" (renamed "Butch Cassidy's Rustler's Rendezvous at Hole-in-the-Wall" with the addition of cattle herding for a few days) was an immersion into the Wild West, and included two nights of camping out (think "Cowboy Safari"). Their most popular ride, "Wyatt Earp's Vendetta Ride," was sanctioned by Arizona in 2011/2012 as an Official Centennial Event and is filled with the history of Tombstone, the Earp's, and the Cow-boys. "Billy the Kid's Regulator Ride," patterned after the successful Vendetta Ride template, was another hit. With each passing year, more rides were added and some were simply enhanced or replaced, if only because their repeat business is fabulous and there is always that need to keep everyone coming back for more. One such ride, their "John Wayne's Monument Valley Ride," has been an overwhelming success. Their "Jesse James' Great Train Robbery," headquartered in Silverton, Colorado includes riding the beautiful San Juan Mountains and robbing the Durango & Silverton Narrow Gauge Railroad, and is another immersion into Wild West history, Victorian elegance and great fun! In 2015 they successfully completed their "Comanche Moon Ride," a riding adventure to Palo Duro Canyon, Texas - inspired by the novel "Empire of the Summer Moon" - where the Comanches, Quanah Parker, the Texas Rangers, Charlie Goodnight, General Ranald Mackenzie and the 4th Cavalry all called home - fantastic Texas history and hospitality. It seems all of their rides are not only history-based, but usually have a movie behind them as well (think "Tombstone" or "Butch Cassidy & The Sundance Kid" or "They Died with Their Boots On" to name a few). It was only natural that eventually they would do a horseback ride centered on filming a non-commercialized Western. So, in 2016 Steve & Marcie undertook their most successful, most daunting and most stressful adventure... they created a movie-themed ride entitled "Ride the Reel West" with the purpose of giving their riders an experience in film making. This 80-minute Western movie called "The Peace Makers: The Night of the Ripper" received a total of 5 awards from the Wild Bunch Film Festival in Willcox, AZ in October 2017, including best screenplay, best comedy Western, 2 acting awards and best movie poster. Other past adventures have included Ghost Town rides, Horsemanship Clinics, Jeremiah Johnson's Wilderness Ride around Jackson Hole, WY, Billy the Kid's Regulator Ride in Lincoln, New Mexico and a scenic Canyon de Chelly Ride. In 2013, Great American Adventures went European, with its custom-designed historic ride in Sicily (think Spaghetti Western), called, appropriately enough, "The Ride with No Name." In 2018 Wild Bill Hickok's Last Ride in Deadwood and the Black Hills was launched and sold out immediately... not only its first year, but the following year as well. 2019 promises two additional rides: a movie-oriented ride called "Randolph Scott's Ride Lonesome" in Lone Pine and the Alabama Hills of California and the historic "Buffalo Bill's Great Scout Ride" in and around Cody, Wyoming and the Shoshone National Forest. Although not mandatory, many clients dress in Old West clothing during these adventures. After all, we are fulfilling our childhood fantasies of playing cowboy & cowgirl -- aren't we? After all these years, the multitude of repeat riders have started calling themselves "the GAA Family." Truly an honor for Marcie and Steve. Why not become a part of our family? Join us! Want a memorable vacation of a lifetime? "Saddle Up and Follow Your Dreams"
Take a Great American Adventure! Great American Adventures is owned and operated by Steve and Marcie Shaw, both having shared a great love for history revolving around the Wild West. That common interest blossomed into a passion and they began to offer horseback riding tours that showcase noteworthy locales and equally prominent Western icons. From Billy the Kid’s journey to Lincoln, New Mexico to Custer’s Last Stand at the Little Bighorn, the tours they organize promote an engaging and enriching experience for every participant. As they create and host their historic horseback riding tours, Steve and Marcie strive to make a difference in people’s vacation experience. 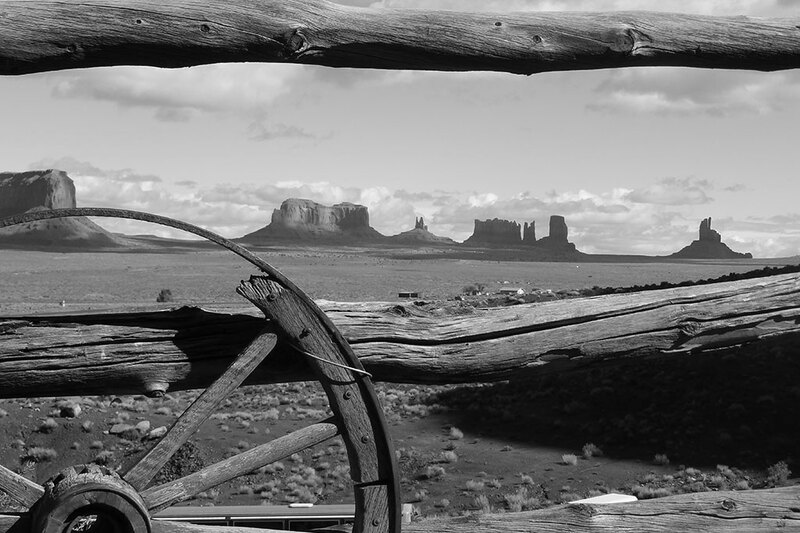 Whether you choose Wyatt Earp’a Vendetta Ride in Tombstone, AZ or John Wayne’s Monument Valley Ride, each tour is meant to be an adventure separate from the rest of the herd; a fun and historic journey in itself. Every ride is considered special and safety is likewise considered greatly. With Great American Adventures, riders take the trails less traveled, wearing period-correct clothing (though not mandatory). You will be accompanied by knowledgeable historians and wranglers. Apart from the usual tour, Steve and Marcie also incorporate a few surprises for each ride, ultimately creating one memorable vacation experience for everyone. From their John Wayne’s Monument Valley Ride to Wyatt Earp’s Vendetta Ride, Steve and Marcie hope their horseback riding tours will develop, in every rider, a unique appreciation for their adventures and its remarkable connection to Wild West history. Be a part of Great American Adventures’ Historic Wild West Horseback Riding Adventures and Tours. Travel to historic sites, see the wonders of Monument Valley or relive the excitement of Wyatt Earp and his posse in Tombstone, AZ. Steve and Marcie Shaw are waiting for you to book your reservations today… Join their ever-growing “family” of Wild West history and Western-movie loving horseback riders. Steve Shaw, creator and owner of Great American Adventures, LLC has had a passion for the Wild West and travel since he was a small boy. Every summer his parents drove from their Southern California home to Texas and Oklahoma to visit family, and Steve always wore his Western clothes, his beloved cowboy hat, boots, buscadero holster rig and play-guns from his favorite TV Westerns. Out the car window he envisioned himself at a gallop, riding over the rough and rugged terrain in pursuit to save a heroine in distress, fulfilling his cowboy fantasies. At this same time, 3,000 miles on the other side of the United States, a very young Marcie was playing Annie Oakley and other Western feminine heroines in her hometown of Pittsburgh, PA, fulfilling her childhood cowgirl fantasies. Separated by a continent, neither knew what the future held for them… a passion for one another, a passion for travel and ultimately, a passion for the Western… both historical and in film. All of this would be realized once they met and married some 20 years later. Embarrassingly as it sounds, during Steve’s last year in college and having been accepted to the United States Air Force Officer Training School, he and his college buddy, another OTS candidate, traveled the country looking for “locations” for their homemade, thirty-minute, 8-millimeter Western called “Butch and the Kid,” patterned after Paul Newman’s and Robert Redford’s “Butch Cassidy and the Sundance Kid.” You can imagine what his Air Force recruiter thought when he saw this film at Steve’s going away party! In fact, while serving in the military, after having earned his aviation wings and graduated from B-52 Navigator/Bombardier School, Steve chose, of all USAF bases, the one in Rapid City, South Dakota … Ellsworth Air Force Base. Why? Because of the surrounding area’s history: the Black Hills, Sitting Bull, Crazy Horse and the Sioux Nation, Gold Rush, Deadwood, Wild Bill Hickok, General G. A. Custer, Wounded Knee and much more. The other officers thought he was crazy… but Steve had the time of his life!! His military obligations behind him and both he and Marcie having retired early from corporate America – an accomplished goal – Steve soon gravitated to writing short stories about the Wild West. In a few short years, Steve had written over 300+ articles published in various magazines, including such subjects as Wild West history, Western celebrity interviews, Western lifestyle events, book reviews, and fiction and nonfiction short stories. With these stories, Steve won a few writing awards! In 2004, Steve was honored to be accepted into the prestigious Western Writers of America, Inc., organization. In 2007, his first novel, “Beyond the Rio Grande,” received an award as “Finalist,” from the New Mexico Book Award program (click on the book for a summary, reviews and to purchase), as well as excellent reviews from magazines, fellow authors and readership clientele. You can find the story line, reviews, testimonials from readers and how to purchase this book under “About” in the header. Just click on it. Steve is the first to admit that Marcie’s support in his writing endeavors is invaluable … without her, he’d never complete one story! As a result of his writings, Steve was featured as a historian in 2004 on the A&E Biography channel’s “Doc Holliday” episode. Both Steve and Marcie began doing background work in TV and films and both appeared on the History Channel’s “Wild West Tech.” Steve also appeared on HBO’s Deadwood series, Disney’s 2013 The Lone Ranger, and Seth McFarland’s “A Million Ways to Die in the West” in 2014. As a result, both have numerous television and film production credits. Wanting to do more than just write about Wild West adventures, Steve and Marcie, hand-in-hand, were soon traveling to be part of the action… such as riding in Wyoming at the Hole-in-the-Wall location where Butch, Sundance and their Wild Bunch hid out. Marcie, childhood friends of the Captain of the Delta Queen Steamboat, mentioned it would be fun cruising down the Mississippi River on a steamboat (after all, she did camp out – for the first time in her life – every night for five nights during their Wyoming horseback ride – and Steve owed her big time for that experience). Cruising on this historic paddlewheel and wearing 19th Century period-correct clothing, Steve & Marcie had a brainstorm… if they were having this much fun, why wouldn’t others? Thus began their “Greatest Adventure” … offering Wild West adventures on horseback rides, steamboat cruises, trains & tours – striving for a look back into our Wild West history. True, their adventures have taken them across the globe, touring most of Europe… heck, even Buffalo Bill toured Europe! Marcie, never to be out-done by Steve, began sewing – a skill she learned as a young girl – and created her own Victorian ball gowns, 19th Century-period day dresses, riding attire and even a few of Steve’s clothes. In fact, she became such an excellent seamstress, the History Channel approached her about creating designs for some of their shows. She also became a fabulous photographer, taking many of the photos within this website and she achieved that rare photo… which appeared on the cover of the June 2009 True West magazine, themed “Custer’s Ride to Glory“! Her photos have since appeared in True West, Wild West, Cowboys & Indians and American Cowboy magazines. Since 1998 Great American Adventures has offered steamboat cruises on the Mississippi, Ohio and Cumberland Rivers (think riverboat gambler and Civil War), the Columbia River in the Northwest (think Lewis & Clark and the Fur Trade), and in Alaska (heck, even Wyatt Earp went there). Their train trip to the Canadian Rockies, private tour of Gettysburg, and historic tour of south Texas and the Alamo (where Steve & Marcie renewed their 30th wedding anniversary vows at John Wayne’s Alamo Village) were all greatly received, each becoming favorites among friends and clientele. Their first historic horseback ride was offered in 2004 — “Custer’s Ride to Glory.” From then until 2011, this ride was the epitome of historic rides, offering cavalry training school, fighting Indians on the Crow Indian Reservation, riding various historic routes that the troopers of Custer’s command had ridden at the Little Bighorn, and, once, staying at the 7th Cavalry’s barracks at Fort Abraham Lincoln and training on the very parade grounds where Custer and his famed 7th Cavalry trained. With the success of their “Custer’s Ride to Glory,” Steve & Marcie had the confidence to create, organize and host other rides. “Butch Cassidy’s Hole-in-the-Wall Ride” (renamed “Butch Cassidy’s Rustler’s Rendezvous at Hole-in-the-Wall” with the addition of cattle herding for a few days) was an immersion into the Wild West, and included two nights of camping out (think “Cowboy Safari”). Their most popular ride, “Wyatt Earp’s Vendetta Ride,” was sanctioned by Arizona in 2011/2012 as an Official Centennial Event and is filled with the history of Tombstone, the Earp’s, and the Cow-boys. “Billy the Kid’s Regulator Ride,” patterned after the successful Vendetta Ride template, was another hit. With each passing year, more rides were added and some were simply enhanced or replaced, if only because their repeat business is fabulous and there is always that need to keep everyone coming back for more. One such ride, their “John Wayne’s Monument Valley Ride,” has been an overwhelming success. Their “Jesse James’ Great Train Robbery,” headquartered in Silverton, Colorado includes riding the beautiful San Juan Mountains and robbing the Durango & Silverton Narrow Gauge Railroad, and is another immersion into Wild West history, Victorian elegance and great fun! In 2015 they successfully completed their “Comanche Moon Ride,” a riding adventure to Palo Duro Canyon, Texas – inspired by the novel “Empire of the Summer Moon” – where the Comanches, Quanah Parker, the Texas Rangers, Charlie Goodnight, General Ranald Mackenzie and the 4th Cavalry all called home – fantastic Texas history and hospitality. It seems all of their rides are not only history-based, but usually have a movie behind them as well (think “Tombstone” or “Butch Cassidy & The Sundance Kid” or “They Died with Their Boots On” to name a few). It was only natural that eventually they would do a horseback ride centered on filming a non-commercialized Western. So, in 2016 Steve & Marcie undertook their most successful, most daunting and most stressful adventure… they created a movie-themed ride entitled “Ride the Reel West” with the purpose of giving their riders an experience in film making. This 80-minute Western movie called “The Peace Makers: The Night of the Ripper” received a total of 5 awards from the Wild Bunch Film Festival in Willcox, AZ in October 2017, including best screenplay, best comedy Western, 2 acting awards and best movie poster. Other past adventures have included Ghost Town rides, Horsemanship Clinics, Jeremiah Johnson’s Wilderness Ride around Jackson Hole, WY, Billy the Kid’s Regulator Ride in Lincoln, New Mexico and a scenic Canyon de Chelly Ride. In 2018 Wild Bill Hickok’s Last Ride in Deadwood and the Black Hills was launched and sold out immediately… not only its first year, but the following year as well. 2019 promises two additional rides: a movie-oriented ride called “Randolph Scott’s Ride Lonesome” in Lone Pine and the Alabama Hills of California and the historic “Buffalo Bill’s Great Scout Ride” in and around Cody, Wyoming and the Shoshone National Forest. Although not mandatory, many clients dress in Old West clothing during these adventures. After all, we are fulfilling our childhood fantasies of playing cowboy & cowgirl — aren’t we? After all these years, the multitude of repeat riders have started calling themselves “the GAA Family.” Truly an honor for Marcie and Steve. Why not become a part of our family? Join us!